To honor the integral role that the Waccamaw Arts & Crafts Guild played in the Franklin G. Burroughs-Simeon B. Chapin Art Museum’s establishment, the art museum proudly hosts the guild’s annual spring juried art exhibition, now in its 20th year. This year’s exhibition will feature a diverse array of media, including ceramics, drawing, fiber, graphics, mixed media, painting, photography, sculpture and wood carving, all completed by local artists within the past two years. Waccamaw Arts & Crafts Guild 20th Annual Juried Art Exhibition will be on display from May 2 through June 1 at the Franklin G. Burroughs-Simeon B. Chapin Art Museum. 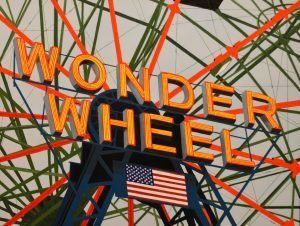 Colleen Bang’s Wonder Wheel, winner of the 2016 Best in Show award, is pictured above.